Last week we looked at how to format your Business Proposal, use a Style Guide, select the right type of font, language and writing style to impress the proposal evaluation team. Let’s look at other ways you can improve your next Business Proposal or Grant application. Always proofread your proposal not once but several times. Content – does your proposal have enough substance? Are your ideas complete? Structure – is the bid organized in a logical manner? Are all facts and figures accurate? Are ideas expressed clearly? Is the proposal design visually appealing? Format – are words spelled correctly, especially proper names? Are all numbers and computations accurate? Are sentences grammatically correct, including subject-verb agreement? Are sentences punctuated properly? Revise, reduce, and rearrange where necessary. Rewrite to improve the transitions between sections and chapters. Are all the major pieces of the proposal in the proper order? Does your bid look attractive? Use headings and subheadings that mirror the structure of the Request For Proposal. Headings and subheadings re-enforce the main ideas and the organization of your proposal to the reader. Use a numbered list when items need to be examined in a specific sequence. Use a bulleted list when items are all equally important. Lists convey a sense of immediacy. A ragged margin is easier to read than one that is right justified because the proportional spacing slows readability. It is easier for the reader’s eye to track from the end of one line to the beginning of the next line when the right-hand margins are jagged. 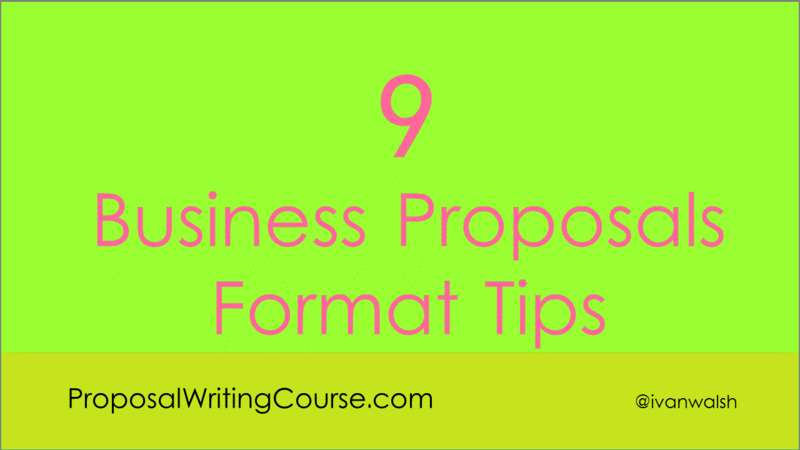 Place page numbers in the top right or bottom center of the pages of your proposal. Do not number the first page! Use bold type to emphasize key words, avoid overemphasis. Consider using serif typefaces for the text of your proposal and sans serif typefaces for titles and headings. Note: Serif typefaces such as Times Roman are easier to read. Sans serif typefaces such as Arial are ideal for titles and headings because they stand out from the body of the text. Use white space to break up passages of text. White space makes your proposal appear inviting and user-friendly. Judicious use of white space breaks your proposal into smaller, manageable chunks of information making it easier for the readers to move through your document and find the relevant information. What other mistakes do we need to avoid when creating Business Proposals and Grant applications?